You’ll be performing your critically acclaimed show Half Breed at Soho Theatre in April before embarking on a UK tour. How are you feeling ahead of the tour? I’m nervous but mainly so excited to take this story to the places that need it the most. Schools/ rural areas… it’s going to be a journey. Feels very surreal to be doing this because I never imagined it would go this far, but very grateful it has. Half Breed places focus on identity; growing up as the only mixed raced resident within a rural part of the UK. What drew you to write a piece on this particular subject? It’s my experience on what it means to be black and I never saw that portrayed anywhere, so I decided to do it myself. Just wanted to see more variety onstage for people of colour, I was tired of seeing/performing the same old stereotypes. Half Breed is a partly autobiographical show, are there any particular events that have inspired the creation of the show? Yes, many things, all at once. Just wanting to prove to myself that I could complete it. 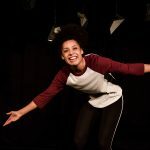 The show started life as a poem performed at spoken word nights, and has since been developed into a 60 minute monologue thanks to Talawa Theatre Company and Soho Theatre’s Writers’ Lab. How have both supported the development of the show? I did Talawa Firsts and the Soho Writer’s Lab. Really lovely people, really nice environment to grow and learn and make mistakes. Their belief in me was enough in itself to help me, but they also give really detailed and helpful feedback. One on one support. I learnt different techniques, saw plays, read plays. They want you to win. Half Breed is a multi-nominated show, having been shortlisted for the Soho Writer’s Tony Craze Award (2016), an Alfred Fagan Award (2016) and a UK Theatre Award. How does it feel to have your work celebrated by the industry? Listen, I just get surprised when people pay money and take time out of their life to see Half Breed! This story is so close to my heart, it means so much that people rate my writing like that. Like, wow, people respect what I have to say and wanna listen… I’ve never experienced that before. Makes me wanna be better and do bigger! I hope they feel tingles when they watch it… if that makes sense. I hope they feel inspired. I hope it enlightens people on different perspectives. Basically, I just want people to leave feeling like they’ve just been punched in the face in the best type of way. You’ve also performed the show in India, how did you find that experience? What was the response towards the show? It was an insane experience. Never been before but every day was so different and amazing! People were so warm. Audiences responded really well and were so open and honest about how they identified. It was really moving talking to people after the show or in Q&A’s. it made me realise that we are all searching for that idea of hope. As writer and performer of Half Breed, you have contributed an unheard female voice in theatre. At present, do you feel that enough is being done to address the lack of nuanced voices and stories within UK theatre? There are many different writing groups and things set up to help writers tell their stories. However, I had to move from my village to London to find them. I think more could be done to support writers from all different areas and backgrounds so we get a range of fresh and raw voices. Maybe it’s about taking risks and tapping into those areas that have never had that outlet or opportunity of a writing group before, seeing what happens. Making people feel like they stand a chance. There’s a lot of hidden talent that just needs to be given a chance. I’m dyslexic, I had no previous experience, I never thought I could be a writer until someone told me I could write. Don’t give up. Have faith in your ideas. Trust your gut.